During my recent shop healing session, I realized I needed a better way to store my drills and chargers. This simple wall-hanging “box” did the trick. I also wanted to make the project fast and easy, so I decided to try out the DowelMax for the first time. The system is a breeze to use and produces strong reliable joints in just a fraction of the time it takes to create a traditional mortise and tenon. Fee free to download the SketchUp Drawing for this project if you want to make your own. But I encourage you to use this as a starting point and build upon it. If I had more time and space, I definitely would have added a few drawers for additional storage. Also, be sure to check out the new Enduro-Var Water-Based Urethane I used on this project. ***Edit***Viewer Kevin sent us a modified Sketchup Plan featuring a beautiful drawer at the bottom. Real woodworking video after long delay. Great, Mark! That DowelMax is really a neat gizmo, but wait… $300 … it’s damn expensive! Love the idea of the timer on the chargers. Just curious as to how it is working for you. Like the cabinet, I might just have to borrow the idea but like you said might add some drawers underneath. As always great videos and great site thanks a bunch for all you do for the woodworking community. I came back to post this exact comment. $300 and no reinforced miters. What do you mean by no reinforced miters? I’ve watched the DowelMax demo’s on their site and the system really looks impressive. The tool appears to be very well made and I think paying a little more for quality tools can save you time, frustration, and money down the road. I think the DowelMax system has a lot going for it and look forward to using it on those project that lend themselves to this type of joinery. Thanks Marc for the simple real world demo. Hopefully we hear more about your experiences with this system. Great project. Good info on the dowel thingy. I wish I had your scrap pile to work with. Amen, Bill. Figured maple and bubinga for a shelf in the shop? And here I’d have considered crating lumber lavish for such a fixture. But that’s just me. Carry on and I can’t wait to see the gaboon ebony dustpan. Awesome video! The dowel max is awesome, but I agree with Jozef….300??? Must have a real healthy margin! I might go 150…..but wow… Is this 200 better then using say pocket screws on a project like this? True, I suppose it is….What is your opinion? It looks a lot stronger then pocket screws……. Definitely strong enough for pretty much all furniture applications. And I would use dowels before pocket screws, but that’s a personal preference. I like to pay the extra to get “smart chargers” with my cordless tools, but I’m going to use your timer technique for my tools that have dumb chargers. I’d love to see a DowelMax vs Domino joint failure showdown – just sayin’. You should be able to find joinery shootouts in back issues of a few magazines. I know FWW did one recently that included both the domino and dowel joints. Caused a big fuss because the results seemed suspect if I remember correctly. One thing that I did though that I will pass along so anyone else doesn’t make the same mistake. I used a 2nd bit with another depth collar as I wanted to use some 1″ dowels. I couldn’t get the collar off the bit it came with…I think it is welded on. Well the other collar was a POS and slipped a bit without me noticing. I had the Dowelmax setup with the face type configuration and proceeded to drill too far and drilled a bit into the brass clamps on the Dowelmax. Doesn’t affect the use of the device, but sure had me kicking myself. I think I will be using the Dowelmax for pretty much anything I build from now on. 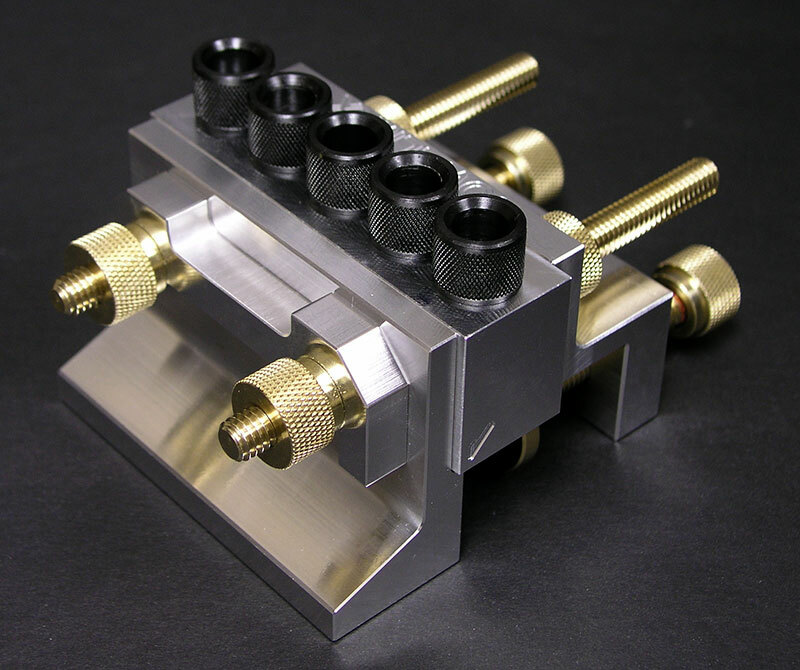 I will be eventually picking up the 1/4″ guide package as well for smaller stock. Because you only had 1 stud to hang the charging station, did that deter you from using a french cleat to hang it? Doh! thanks for that heads up tip! And yes the fact that I had one stud to work with played a role in avoiding the french cleat. At least this way I had two solid contact points. Just a simple, quick and easy install. Great video Marc … DowelMax looks like a cool, useful and very well designed tool. Have requested them to send me some info. But I do agree with the guys here who talk about the Domino. It’s a toss up because both work well at the end of the day. In terms of joint failure comparisons, I won’t bother as both are strong enough for me. Where’s my tax refund … I need $1100 to buy both. I think that’s what it comes down to. Most of these systems produce joints that are strong enough for the vast majority of applications. So it depends on which one appeals to your style of building the most. DowelMax looks great but at $309 is a bit ridiculous for a weekend woodworker like myself. I am lucky to make two big projects a year. In one of the Woodworks episodes David Marks made his own wooden dowel jig specific for the project. I am in need of a drill stand and this video project is perfect for a weekend with my 8 year old. He loves using the drill press and that should work well to make the jig. Just wondering how you center the holes on the end grain? They have various spacers that help you do this. Very nice video, but where is Nicole? Great video as usual. I was interested in how well the Dowel Max worked. I have seriously thought about buying the jig because I use dowels on a lot of my projects. it looks pretty simply which is a good thing when you have a lot of joints to drill. I know I could of went to their website to see it in action but I prefer to get feedback from other woodworkers that aren’t trying to sell it to me. I use the Dowelmax on all my projects. I bought it when it used to $269. It seemed like a lot but has surpassed my expectations. It is so easy to use and works exactly as advertised. All the videos that are produced on the Dowelmax website, are accurate in terms of how long it takes to set up a joint. I built my workbench base using 10 2″ dowels at each point and it has proven to be quite strong. There have been times where I have picked up the workbench (300+ lbs) with a car jack and the joints don’t give any complaints or hint of failure. As far as comparing it to the Domino they are not in the same league price wise. The Domino with all the fixings is right at $1000. I am a Festool junkie (own the sander/vac etc) so I do understand their tools are fantastic. I just do not believe you get that much more value. Unless I was doing it commercially I do ever see myself even thinking about upgrading. If this sounds like a commercial for Dowelmax I am sorry but it is one of the few tools that I have ever bought that I feel changed the way I work in terms of speed, accuracy, and quality of work. Has anyone used the BeadLock system? I bought the master set a couple years ago, and have yet to take it out of the box! Thanks for another great video from TWW. You have once again brought our attention out of the clouds and into the wonderfully practical. This is something I REALLY need to build and hadn’t realized it. Batteries and chargers clutter up things in my shop as it is. I will build mine as you suggested with a wider shelf and some drawers. I think I have some scrap quilted cherry and some soft maple around here somewhere……no sense in doing it half way. I too have thought about the Beadlock system for its simplicity and domino like strength. The price is good as well. I was pleasantly surprised to see that James Kernov was a dowel user. That makes me feel much better about the times I have used them without problems. Thanks again. Great Video Marc! I have never used a doweling jig, but it looks impressive. I felt the same way as you at first and even tried making my own jig, but it was cumbersome and not all that accurate. The more I read up on the dowelmax, the more I wanted to have it. When it is very hard to find used ones out there, you know it’s a great tool. Like Marc said, it’s not so much a jig but an entire joining system. Add to that, the thing will probably last forever. You could spend a lot less for a lower quality device, but I think the time and material that you waste over time will more than add up to a greater amount then just buying the best tool in the first place. I have been using a timer for years in my shop on all my battery chargers. I find that I only plug in my charger when I find the batteries on the drills starting to slow a bit. Most batteries will lose about 10% per month just sitting around not in use. It is not a good idea to leave batteries charging all the time until you are ready to use them. Batteries have a charge memory, if you use the battery for a short time, then charge them constantly, that battery will now have a short life. The battery will start to remember what percentage was used last time in the drill. Do not drain your batteries until the drill stops moving as this could cause a short life as well in that battery. I have 8-9 drills in my shop with many batteries, since I am lazy and don’t like chaging bits, drivers, etc. plus I like drills at arms reach all over my shop. I have some batteries that are going on 10 years old and still going strong. Thanks for the great info, especially on the Doweling jig. I’ve used other less expensive dowel jigs in the past and have found them all to be either to difficult to use or inaccurate and thus have not had very good results with them. I’ve got a whole box full of dowels that I’ve had for years and never used because of this. I think you have restored my faith in the use of dowels again using this Dowel Max Jig. So now I’ve got to ask myself if I’m feeling lucky enough to wait and win one of these on your monthly drawing or go out and purchase one with my hard earned cash. Marc, do you have any problems with our AZ heat cooking your batteries stored in your garage? I keep all of mine in the adjacent, air-conditioned laundry room, just to be safe. So far so good Steve. But this past summer was the first one in a while that I had to deal with the high heat. My old shop had AC. But I think you raise a very valid concern. And just like with finishes, its probably not a bad idea to bring those puppies inside during the extreme temps. Great video, Marc. And I like the project – useful and simple, although you did make it look pretty special with your wood selection. Mine would probably be made of plywood! I like that DowelMax, but upon checking it out and discovering the price, it falls way down my list of “nice to haves”. While I agree that it is extremely well designed and very useful, the cost is prohibitive for many of us woodworkers who wonder how to afford our next piece of wood. Nice job, I enjoyed the video and project. Just a stupid question but how do the machines stay upright when you take the battery out into the charger ? Hey Robarov. All of my drills come with two batteries. So one is always in the drill and the other is in the charger. But i didn t see a battery in the De Walt charger – so i thought it was a smart remark… guess not. Wow Safety is a big issue – nice all the comments. I guess it worries us all – i got a top-pi machine. (=enormous router) And i m always am very careful – not to say a bit scared – when we use it. dummy proof, very reliable piece of equipment. The initial cost was really hard to get over(especially for the finance dept). As Marc said once your set up and all your check marks are in place production and assembly is a breeze. By the way the finance dept used this to build her own entry table(it was on the to do list)now she wants her own bench! Hey Marc, any plans to use the Dowelmax in any future projects? I don’t have anything planned. The DowelMax is a great system, but I doubt it will get any more use than the other joinery systems I own (FMT and Domino). It took me a while to decide on buying this US$ 300 plus system, with my devalued Colombian pesos. Finally I bought it few months ago. I have used it several times, and I am very happy with it. It is a very simple to use and very precise tool. It looks small for the price… But at the end I realized that what you pay is for a good solution, and this system does it very well. Marc, your videos are excellent! Well I got around to making my charging station, based on your design and installed with French cleats. Love it man! Well done on the design and thanks for the great info! Especialy for properly loading battery packs I don´t trust timers.For modern chargers and packs their electronics shoud do the magic. What I more prefer is some kind of general “kill switch” for the whole shop. Just some kind of “emergency stop” button next to the door and you can easily shut down al electricity when leaving. Besides preventing fire hazards this is also good in case of an emergency when someones wife, family or emergency personal might not know where to shut down a machine. It might also be a good idea to have such kil switches all around the shop. First post around here. I’d like my first comment to be that I have really enjoyed your videos Marc. For me it’s a little like I’m the guy that flips burgers at McDonalds watching Julia Child cooking videos, but it’s still cool. I had a comment about the general utility of dowel joints in situations where strength is important. I’ve repaired a lot of wood casement windows with failed joints in a building we own. The windows were built in 1972 with 3/8 inch x 2 inch dowels at the joints. The system was completely inadequate and almost every window failed in the building. Over the years various people tried all sorts of things to fix them without significant success so I have a good feel for what doesn’t work. What does work very well is 7/16 inch x 4 inch dowels. I drill a hole through the outside of the stile into the rail. I use a drill centering jig that I got at Rockler to insure that the dowels are nicely centered. I use Titebond III glue, but I used to use Gorilla Glue and that has worked well also. We’ve owned the building for many years now and we’ve never had a failure in a window repaired that way and casement windows take a real beating from the weather and the nature of the way they are suspended by the hinges outside the building. And a comment on the Beadlock system question that somebody asked above. I bought one partially because I thought it might be better than the simple dowel system I was using for the windows but I tried it out first on an entertainment system cabinet that I built . I didn’t like it at all. It’s a lot of messy drilling and redrilling for not any reason that I can see. Simple dowels seem to work very well in applications where strength is an important issue and why even think about messing with the system in furniture where most joinery approaches seem strong enough? I’m surprised that Rockler carries the system. If I wanted to do some joinery with a minimum equipment investment I’d think pocket screws or an inexpensive dowel jig would be a much better choice than the Beadlock system. Sorry for the long post on my first shot but just one more comment: The end of the Dowelmax intro video on their site shows a side by side testing of the break strength of various joint techniques. Not surprisingly Dowelmax does pretty well in Dowelmax tests, but I’ve seen similar results on a site not affiliated with Dowelmax. This is exactly what I needed! I’ve been using my window seal to charge my batteries for the past couple years. The Video was very helpful. Thank you! Yet another project I have planned. I’m going to incorporate this concept in to a couple of rolling in-feed and out-feed tables. The dowel jig looks pretty cool. This is a task I have struggled with in the past. I’ll have to save up and give this one a shot. Do you know about how much they run? Cool. Just getting started with woodworking. Started with video #1 and working my way up. I have a $10 dowel guide that I’ll try. If it works like I hope, I’m really interested in the DowelMax.